Okay, I’m a sap for dogs. 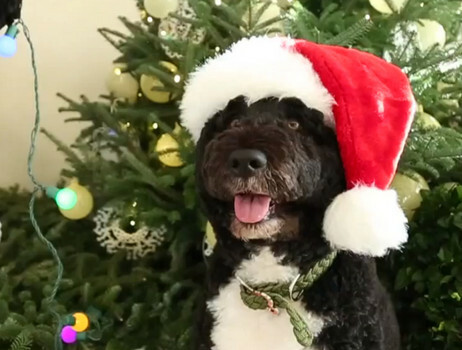 I love the video of Bo Obama checking out the White House holiday decorations. Either he’s grown to the size of a Shetland or this clip was shot on a miniaturized sound stage. 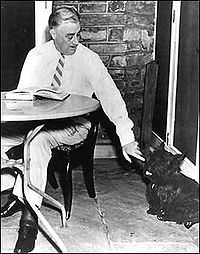 Bo’s star turn carries on a venerable tradition of first dog publicity flicks, notably that of FDR’s Fala, Details of the filming of the aptly-named “Fala, The President’s Dog” are laid bare in deadpan detail in a diary entry of the president’s cousin and confidante, Daisy Suckley. (New York Diaries: 1609-2009. p.100) Daisy was invited to view a rough cut of the film by Metro Goldwyn Mayer in New York in 1943. She dishes that a“piece of bacon was put under the bottom of a scrapbook which Diana [daughter of presidential advisor, Harry Hopkins] & Fala are looking at with such interest.” A substitute Fala had to be used in a couple of scenes. Unfortunately, the stand-in’s coat was shorter than the star’s, so extra fur was glued onto him.